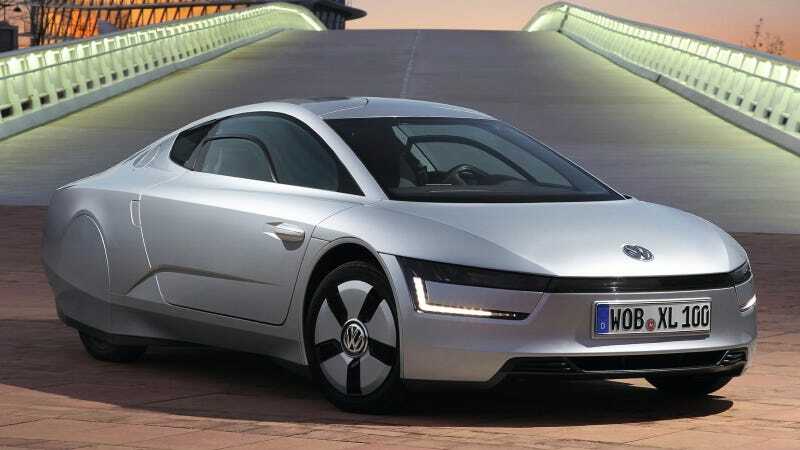 Wait, The Volkswagen XL1 Is Going To Cost How Much?!? When our own Máté Pétrany drove the 261 miles per gallon Volkswagen XL1 in Europe, he said it was just like driving the future. Here's the thing about the future, though: it is apparently mad expensive. According to German business journal Wirtschaftswoche, the super-efficient diesel-electric hybrid XL1 will cost 111,000 Euro, which is about $146,000 in the U.S. Fffffwhaaa? Chalk that insane price tag up to the expensive materials and new technology used on the car, like its carbon fiber chassis and body panels. Despite its high cost, the newspaper says there is a considerable amount of demand for the XL1 among collectors and enthusiasts. Right now only 200 XL1s are planned for production, and one VW official called it "more of a lighthouse" vehicle than an actual product key to their business plan. It sounds like an amazing machine, but there are a lot of other cars I'd rather spend $146,000 on.